In The Raw: When Is A Fruit Not A Fruit? When It's A Fig! When Is A Fruit Not A Fruit? When It's A Fig! Daddy had a green thumb. Stick a twig in some dirt and he'd make it grow, like magic. That's exactly what he did when I was about seven years old — put a branch in the ground and, seemingly overnight, that Ficus grew into a 20-foot tree with sweet chewy fruit. In fact, I even have a photograph of a 12-year-old me, sitting up in that tree, noshing on a luscious fig. After Dad died six years ago, my brother (who inherited the green gene) decided to plant a fig tree in his own backyard in memory of dear ol' Dad. Guess what I was sent home with Sunday after the backyard Fourth of July cookout? A basket full of figs! I don't recall having ripe figs this early in the summer, growing up. But, it's been crazy, hothouse hot this year. In fact, we've had the consistently hottest run from April 1 through the July Fourth holiday weekend in more than a century. And July's just getting started! If you've never tasted a fresh fig, oooh boy, are you missing out. They're chewy (flesh), smooth (skin) and crunchy (lil' seeds), all rolled into one! And, very sweet. Mmm, nature's candy. 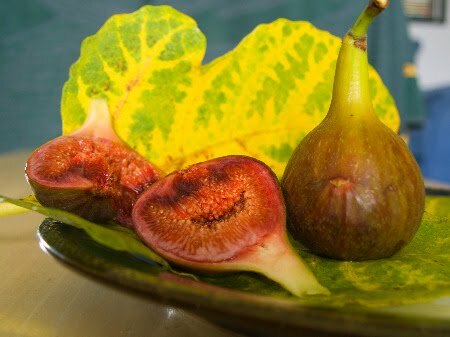 Here's an interesting tidbit I remember learning as a kid: figs aren't actually fruits at all. Yup, you read that right. The fig is a synconium, or gourd-like receptacle. That means it is both home and hiding place to thousands of tiny flowers and filled with the edible seeds that give dried figs their slightly nutty flavor. Pretty cool, huh? Fresh figs are quite delicate and perishable. You can really only store them in the fridge for a few days, so when you can get 'em, eat up and enjoy! The good news is, they're also delicious when dried. Figs take about four days to dry in the sun, or about 12 hours in the dehydrator. Once dried, figs can be stored in a cool, dark place for six to eight months. Unless you're lucky enough to have a brother with a fig tree in his backyard, your best bet for finding fresh figs right now is in the grocery stores. California figs are usually available in the produce aisle from June to September. Look for figs that have a rich, deep color and are plump and tender, but not mushy. Depending on the variety, they'll range from blackish-purple to greenish-yellow in color. Have a sniff. They should have a mildly sweet fragrance. If they smell sour, that's a pretty good indication that they're spoiled. Before eating, wash them thoroughly under cool water and gently remove the stems. Place the greens and fennel in a large bowl and drizzle with the lemon juice and olive oil. Toss well. 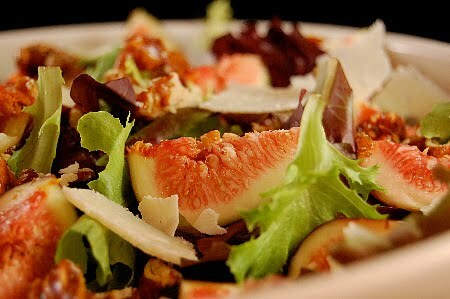 Plate the salad and top with the figs. Serve immediately. Do you have any fond memories of backyard eats from when you were a child?